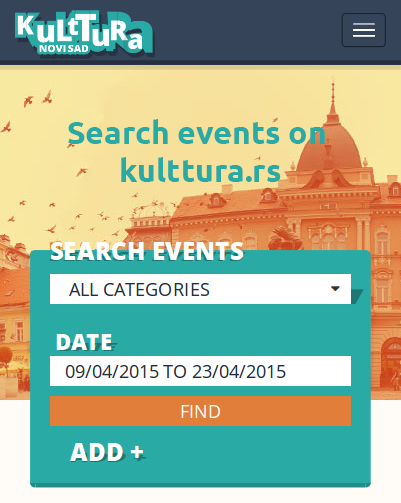 PLU5 platform is the proof that the ‘Novi Sad 2021’ Foundation promotes policy of cultural diversity in Novi Sad. It was initiated last year, and it reaches its culmination this November. Conference was held in order to present the programme within the platform. Mr Lazar Jovanov, artist programme manager of the ‘Novi Sad 2021’ Foundation presented the programme and valuable concept of the PLU5 platform adding that the platform confirms values of the ‘Novi Sad 2021’ Foundation presenting itself with the slogan ‘For New Bridges’. ‘Within the Rainbow Bridge, we advocate for belief that diversity is our strength and advantage. In accordance to this, the platform that fosters the richness of diversity of cultural expressions was created in 2017 – advocacy for human and civil rights despite language, religious, national and gender background. The platform includes four big events that are its framework at the same time: Synergy#WTF – International Theatre Festival of Language Minorities, remarked as one of the best multicultural projects within the application for the European Capital of Culture title, European conference dedicated to minority and local media, ‘C.A.T’ multimedia platform of contemporary women art, theories and activism and Novi Sad Jazz Festival’, added Jovanov. Mr Valentin Vencel, director of the Novi Sad Theatre, explained the concept of the Synergy#WTF festival and said that such programmes influence the creation of cultural profile of the city of Novi Sad and that this is the good way towards success. He sees the European Capital of Culture title as the chance: ‘People from Novi Sad Theatre perceive this acknowledgement as the situation equal to the one when Novi Sad gained the status of the royal free city’. Mr Vencel added that the idea is to held conference of representatives of minority theatres from around the world during this year’s Synergy#WTF festival in order to create international professional organisation that will present, gather and network theatres of language, ethnic and other minorities. Cooperation between the ‘Novi Sad 2021’ Foundation and Novi Sad Jazz Festival started last year through the ‘ECoC Day’ held within the festival, while it continues this year through the ‘European Jazz Orchestra Twins’ project. Shalosh Trio from Israel will present themselves to the citizens of Novi Sad during the main festival programme with the support of the Embassy of Israel in Serbia. Artists Ksawery Wójciński – double bass (Poland) and Szilveszter Miklós – drums (Hungary-Serbia) will stay in Novi Sad during the Novi Sad Jazz Festival within the ‘Plants AiR’ residential programme of the ‘Novi Sad 2021’ Foundation in Novi Sad from 7 until 12 November. They will create new copyright music material with Jasna Jovićević, while they will dedicate part of their stay to workshops of improvisation with musicians and students interested in the programme. Ms Vesna Kaćanski, manager and executive producer of the Novi Sad Jazz festival, addressed the audience and announced 10 concerts within the main festival programme, focusing on the ‘Jumbo Big Band’ project. With the support of the Foundation, citizens of Novi Sad will have a chance to hear three big bands from Ljubljana, Zagreb and Belgrade, who will play separately during the first part of the concert while they will perform together as the ‘Jumbo Big Band’ during the second part of the concert. The highlight is that these three orchestras will perform together after 28 years. The second European conference dedicated to minority and local media will be held on 15 and 16 November. The topic of cultural heritage will be discussed by searching for the answer to the following question: ‘Are minority media cultural heritage?’, stressed Ms Nataša Heror, director of the ‘Heror Media Point’ media agency. ‘During the two-day conference, attendees will have a chance to hear how German media in Denmark, Catalonian in Spain, Sorbs in Germany function, while one of the speakers will be media editor from Lithuania, who will be speaking in Polish language‘, added Ms Heror. Ms Vera Kopicl, director of ‘(Re)connection’, union of feminist organisations and manager of the C.A.T programme (culture, activism, theory) will be talking about the ‘C.A.T’ conference, which will be organised within the PLU5 platform from 19 November until 1 December. ‘This year’s ‘C.A.T’ deals with the topic of ‘Art or Pact’ (Art ili Pakt) and discusses dilemma of neoliberal capitalism and censorship that artists across world have. Central part will consist of exhibition ‘ART or PACT: performance, performativity and document’ as the bridge that connects other parts of the programme. The exhibition will be opened with the performance of Vlasta Delimar in the Gallery of Association of Fine Artists of Vojvodina on 19 November. PLU5 platform envisages numerous programme-project activities focused on religious, cultural and national tolerance, cultural values, cultural identities and contents characteristic for national minorities, who live, work and create on the territory of Vojvodina and Novi Sad. One of the goals of projection of this programme platform is to re-examine position of ‘minority’ in contemporary social-cultural circumstances.